I am SOOOO happy it's Friday, you have no idea! This week has been a really long one and I'm so looking forward to just relaxing and perhaps indulging in some pizza this weekend! There's a seasonal tag going around entitled "fall favorites" and this cashmere dress is definitely one of my fall favorites! I purchased it years and years ago on sale at Annie Sez. 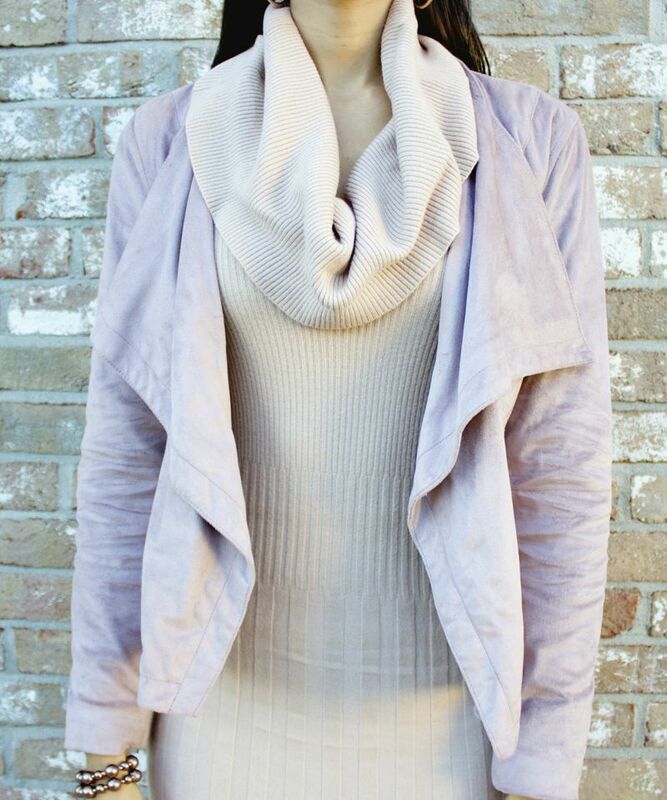 It's my only cashmere piece and I always feel so luxurious and extra cozy when wearing it! I was able to find two dresses (here & here) that are quite similar, both on sale too, so you can feel the exciting feeling I felt when I purchased mine on sale; isn't that such a great feeling?! Not only do I love the dress because it's cashmere and in blush pink, which makes for an ultra feminine combo, I also like the cowl neck, which works really well with my body shape, pear. If you also happen to be a pear shape, then you have most likely gone through the experience of having to try on a ton of different dresses because of some making your hips appear much larger and your top that much more smaller in comparison. Cowl necks instantly help to balance out our proportions by creating some dimension up top, making it suitable for rectangular shapes, too! If, however, you are more curvaceous up top (apple and inverted triangle shapes), as opposed to the bottom, I'd suggest you avoid the cowl neck and opt for a simple style. You could always belt it or add a duster cardigan to help create a nice clean streamline, but avoid adding additional volume to the bust area, as it will make it appear even larger in proportion to the rest of your body. I hope you all found this post helpful and inspirational! Thanks so much for stopping by and I hope you have a fabulous weekend, my beautiful friends! Next: Plums & Olives Previous: Why Finding a Muse Makes Finding Your Personal Style Easier!